B. Add the rest of the ingredients: the gandules (and their broth), tomato sauce, water (or stock), the rice and the seasonings. Stir to completely mix ingredients. C. Cook on high heat until the water evaporates and the surface of the rice is exposed, but not completely dry. D. Lower the heat immediately to "low", and cover. E. Cook, covered, approximately 20 minutes. Remove cover, taking care to not let the water that's condensed on the cover drip back into the pot! 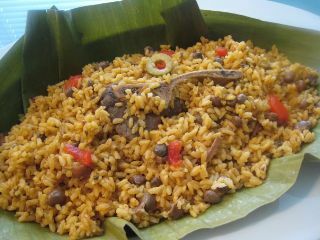 [ This might lead to what is know as arroz mogollado (pronounced moh-go-yao) - soggy rice! The cardinal sin of any good Puerto Rican cook! ] F. Using a large serving spoon, carefully mix the rice by taking scoops from the side furthest from you, and gently placing them towards the center of the pot. Then turn the pot 1/4 turn. Repeat 3 times. Rice and Green Pees recipe.